The inlet air duct is located near the exit end of the tape caster to enable counter-flow circulation through the drying chamber. The duct is equipped with an inlet filter screen, an electric resistance heater, and an air flow safety interlock pressure switch. The heater is capable of heating the inlet air up to 150o C, while controlled with a digital temperature controller, and protected with an over-temperature controller, both of which are located in the control console. Electric resistance heaters are attached to the underside of the drying chamber and arranged into individual temperature control zones. Each zone occupies a ten foot (10′) length and is equipped with independent temperature sensing and controls. The PRO-CAST HMI (Human Machine Interface) PLC/PC control integrates the major components of the process control system into a single package. The PLC (programmable logic controller) performs discrete and analog control of the tape caster. A panel mount computer interfaces to the PLC, providing a flexible, convenient operator interface to the tape casting/coating process running on Microsoft Windows 2000/NT and programmed in GE-CIMPLICITY. 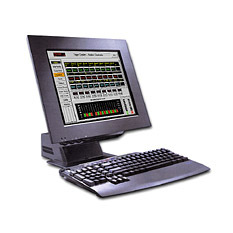 The PC connects via standard TCP/IP ethernet to a GE-Fanuc 90/30 series programmable logic controller (PLC) located in a free standing control console. The 90/30 PLC is a modular based rack system which includes discrete and analog I/O modules used for all logic control, PID loop control, and monitoring. 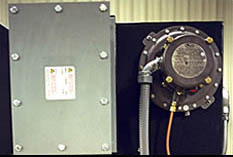 The carrier drive system is integrated into this package. This system also features a 7 day/24 hour clock for automatic starting and stopping of the system, a recipe manager capable of storing multiple temperature profiles, historical trending, real time trending and alarm logging. Stainless steel pressure tanks, to mix, hold and deliver material to the doctor blade reservoir, at the feed end of the casting machine, complete with vacuum de-airing system and gauge, all mounted on a mobile dolly, can be provided. This system includes a slip feed pressure regulator and gauge. Automatic control of the slurry level in the doctor blade reservoir, complete with solenoid shutoff valve, modulating valve and operator, level sensor and interconnecting polyethylene hoses from supply tanks (of customer), located in close proximity to doctor blade, can be provided.